R.E. Cheney, Purification and Assay of Myosin V.
K. Ayscough, Use of Latrunculin-A, An Actin Monomer Binding Drug. M.R. Bubb and I. Spector, Use of the F-Actin Binding Drugs, Misakinolide A and Swinholide A.
E.J. Luna, F-Actin Blot Overlays. J.F. Kelleker, R.D. Mullins, and T.D. Pollard, Purification and Assay of the Arp2/3 Complex from Acanthamoeba castellani. M.D. Welch and T.J. Mitchison, Purification and Assay of the Platelet Arp2/3 Complex. K.L. Schmeichel, B.E. Stronach, and M.C. Beckerle, Purification and Assay of Zyxin. C.E. Turner and M.C. Brown, Purification and Assays for Paxillin. J. Lacoste, A. Ma, and J.T. Parsons, Assay and Purification of Focal Adhesion Kinase. T. Jarchau, T. Mund, M. Reinhard, and U. Walter, Purification and Assays of VASP. J.A. Theriot and D.C. Fung, Listeria monocytogenes-based Assays for Actin Assembly Factors. A. Desai and T.J. Mitchison, Preparation and Characterization of Caged Fluorescein Tubulin. D. Meyer, D.R. Rines, A. Kashina, and J.M. Scholey, Purification of Novel Kinesins from Embryonic Systems. D.W. Pierce and R.D. Vale, Assaying Processive Movement of Kinesin by Fluorescence Microscopy. J.B. Bingham, S.J. King, and T.A. Schroer, Purification of Dynactin and Dynein from Brain Tissue. M.P. Sheetz and J. Kumar, Isolation and Characterization of Kinectin. G.S. Diamantopoulos, T.E. Kreis, and J.E. Rickard, Purification and Assay of CLIP-170. F. McNally, Purification and Assay of the Microtubule-Severing Protein, Katanin. Y. Zheng, M.L. Wong, B. Alberts, and T. Mitchison, Purification and Assay of gTubulin Ring Complex. M. Blomberg-Wirschell and S.J. Doxsey, Rapid Isolation of Centrosomes. G.A. Orr, S. Rao, C.S. Swindell, D.G.I. Kingston, and S.B. Horwitz, Photoaffinity Labeling Approach to Map Taxol-Binding Site on the Microtubule. M.A. Jordan and L.Wilson, Use of Drugs to Study Role of Microtubule Assembly Dynamics in Living Cells. K. Oegema, A. Desai, M.L. Wong, T.J. Mitchison, and C.M. Field, Purification and Assay of A Septin Complex from Drosophila Embryos. A. Mukherjee and J. Lutkenhaus, Purification, Assembly and Localization of FtsZ. E.D. Salmon, E. Yeh, S. Shaw, B. Skibbens, and K. Bloom, High Resolution Video and Digital Enhanced Differential Interference Contrast Light Microscopy of Cell Division in Budding Yeast. D.A. Compton, Production of M-phase and I-phase Extracts from Mammalian Cells. V.J. Allan, Organelle Motility and Membrane Network Formation in Metaphase and Interphase Cell-Free Extracts. C. McGoldrick and M. Sheetz, Organelle Motility and Membrane Network Formation from Cultured Mammalian Cells. S.L. Rogers, I.S. Tint, and V.I. Gelfand, An in Vitro Motility Assay for Melanophore Pigment Organelles. J.K. Burkhardt, Purification of Phagosomes and Assays for Microtubule Binding. J. Scheel and T.E. Kreis, Magnetic Bead Assay for Characterization of Microtubule-Membrane Interactions. L. Haimo, Reactivation of Vesicle Transport in Lysed Teleost Melanophores. M.P. Koonce, U. Euteneuer, and M. Schliwa, Reactivatable Cell Models of Giant Ameba, Reticulomyxa. R.J. Baskin, Design and Use of the Centrifuge Microscope to Assay Force Production. Y.J. Han and J.R. Sellers, Motility Assays on Molluscan Native Thick Filaments. A.D. Mehta, J.T. Finer, and J.A. Spudich, Use of Optical Traps in Single Molecule Study on Nonprocessive Biological Motors. K. Visscher and S.M. Block, Versatile Optical Traps with Feedback Control. Y. Wang and R.J. Pelham, Jr., Preparation of a Flexible, Porous Polyacrylamide Substrate for Mechanical Studies of Cultured Cells. C.M. Field, K. Oegema, Y. Zheng, T.J. Mitchison, and C.E. Walczak, Purification of Cytoskeletal Proteins Using Peptide Antibodies. J.E. Eriksson, D.M. Toivola, C. Sahlgren, A. Mikhailov, and A.S. Harmala-Brasken, Strategies to Assess Phosphoprotein Phosphatase and Protein Kinase-Mediated Regulation of the Cytoskeleton. T.M. Svitkina and G.G. Borisy, Correlative Light and Electron Microscopy of the Cytoskeleton of Cultured Cells. Subject Index. Author Index. 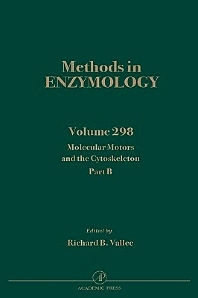 This Methods in Enzymology volume continues the description (initiated in Volume 85) of the purification and assay of this diverse group of proteins involved in cytoplasmic organization. It discusses some of the more promising attempts to apply techniques of molecular biology genetics and molecular cytochemistry to these proteins. Worcester Foundation for Experimental Biology, Shrewsbury, Massachusetts, U.S.A.